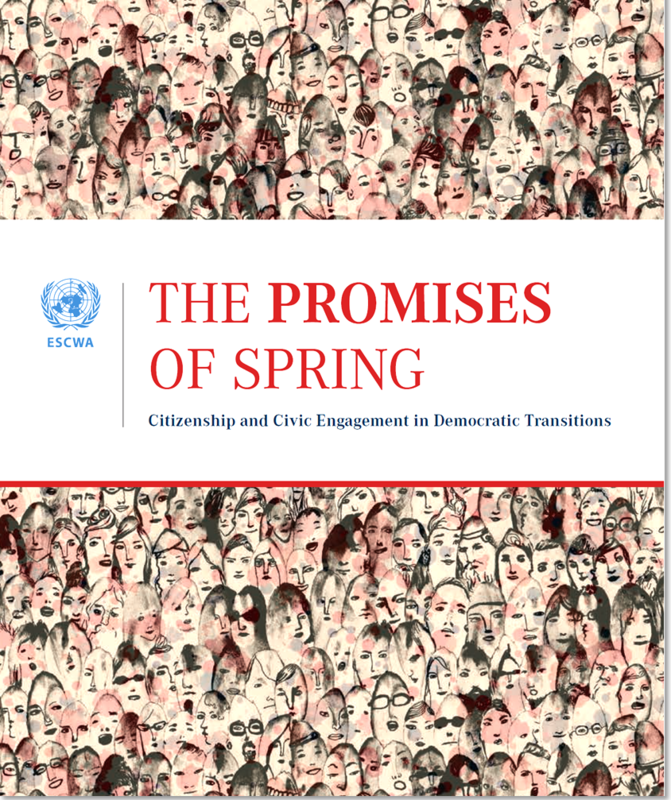 In a multi-year study of the impact of the Arab Spring on democracy, social development, civic activism, and governance, the UN Economic and Social Commission for Western Asia (ESCWA) released “The Promises of Spring – Citizenship and Civic Engagement in Democratic Transitions” in mid-2013. The report team was led by Maha Yahya, a senior associate at Carnegie Middle East Center in Beirut. She recently visited Washington, DC where she discussed the trends emerging from the study to date. As could be expected, most of the analysis and commentary focused on Egypt, Tunisia, and Libya, with some references to Lebanon and Syria. This is not surprising, but I believe that a broader perspective would be helpful to adequately represent varying perceptions of citizenship, as well as to understand what factors impact the debate about citizenship and deeper issues of equality, justice, and dignity. Morocco’s experience, before, during and after the Arab Spring, is instructive. As we have seen in countries affected by the Arab Spring, constitutional birthing processes are not without contention. And it is the constitutions, subject to multiple interpretations, which embody many of the “new” dimensions of the emerging social contracts. The ESCWA report stresses that even though there have been many setbacks to participatory democracy in countries affected by the Arab Spring, the empowerment of citizens has not been derailed as a central feature of emerging people power. It is ironic that Arab countries, which strongly emphasize consensus on major issues, often find that in short supply when it comes to redefining the political process in the post-Arab Spring environment. In fact, the redefining process is not only about power-sharing and dignity, but core practices that embody public affairs – the engagement of stakeholders in the political system. The study notes that “active civic engagement by Arab citizens is one through which they would actually be seeking to reinvent themselves and their societies.” Thus, it goes beyond comparing models of democracy and political organization to focus on the values of citizenship as proactive forces behind political participation. Quite instructively, the ESCWA report notes that “…the historical, political and social context of different countries matters…each country has its own dynamic. It evolves according to the specifications of the societal fabric as well as with policy or tactical changes, where those are made by the state or by civil society activists.” It is in this framework of citizenship, constitutional reform, and public space that Morocco’s progress should be measured. In evaluating why conditions of political exclusion and economic marginalization prevalent in the Arab world did not explode before Mohamed Bouazizi’s death in Tunisia in December 2010, the report concludes that “multiple political, economic, social, and cultural injustices and exclusions that Arab citizens were subjected to for decades, and the absence of meaningful venues to voice grievances were among the central catalysts…” In Morocco, opening of public space can be traced to 1998, when King Hassan II, recognizing that stability required greater power-sharing, took two important steps: naming the head of the opposition coalition as Prime Minister, and permitting the large scale growth of hundreds of civil society organizations. His son, the current King Mohammed VI, was quick to build on these openings, and indeed, the role of “citizen” has been a constant theme of his reign, both as a prod to the political parties to become more mature and develop as vehicles for change, and as a recognition that civil society has an enormous role to play in shaping the country’s growth. As MAP reported in 2013, this emphasis is clear in the King’s speech on the 38th anniversary of Morocco’s Green March. “Our aim is to see the Moroccan citizen properly honored, endowed with the attributes of full-fledged citizenship,” he said. “It is in this spirit that we have undertaken a series of profound reforms and major projects,” including the establishment of national institutions and regional bodies for the protection and promotion of human rights that are “known for their independence and credibility.” He also said that no country accepts being “subjected to behavior that is harmful to their security and stability, especially as violence, subversion and intimidation of citizens are incompatible with human rights, and the exercise of freedom can only be done in compliance with the law. When the King argues that “The main goal of economic growth remains the achievement of social justice, which is the bedrock of social cohesion, ” he echoes the centrality of social justice that is a key touchstone of the ESCWA. While pundits may challenge the pace at which Morocco is making progress, it is hard to minimize the salutatory role that the King, greatly respected throughout the country, is playing in a peaceful transition to participatory democracy. It is instructive, in looking at the ESCWA report’s data regarding economic disruptions, that among the non-oil exporters, only Morocco did not suffer large-scale negative consequences from the Arab Spring. This is another indicator of the international and domestic support that Morocco’s reform process, started more than 15 years ago, enjoys. Morocco’s commitment to full citizenship for all Moroccans is enshrined in its Constitution and the implementation legislation coming from the Parliament. Many challenges to enabling progress and reform remain. Many are being tackled through consensus-building among multiple stakeholders – which is a product of Morocco’s recognition that progress and democracy grow from practice and capacity-building that concretely support its citizens’ aspirations.